We think choice is a good thing! 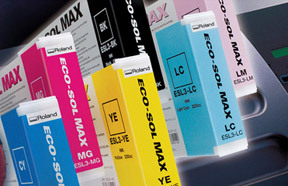 That is why we offer both eco-solvent and pigmented inks in our printers. Fine art, posters and other items that will be displayed indoors benefit from the larger color gament of pigmented inks while outdoor applications need UV tolerant solvents in the ink to stand up to Mother Nature. Our UV-stable pigment inks produce vivid, eye-catching graphics with enhanced color. Ongoing tests at Wilhelm Research indicate over 100 years indoor print permanence with our pigmented ink. Our Eco-Solvent ink offers a wide color gamut, is extremely rugged and scratch resistance with durability up to three years outdoors without lamination. Use one of our many laminates for extreme sun exposure or to increase the life of the product. Click here to find out about our, Screen Printing services. Your Discount Wide Format Printer located in Denver, CO and on the Web.